We did it!!! 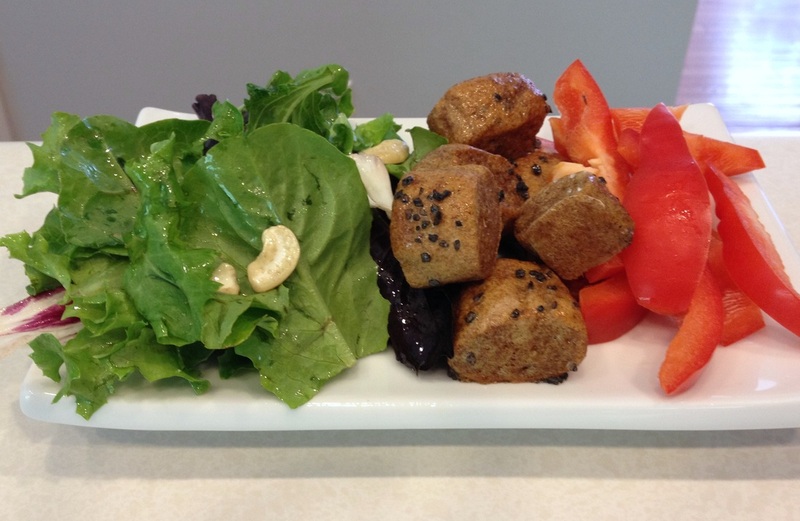 We made it 10 full days of following the Rules and eating real, unprocessed foods! We kept it local as much as possible and made tons of stuff from scratch. All four of us had our moments of weakness but we all stayed strong. I'm very proud of my daughters because I know this was no easy task for them. When I asked them what they are most excited about eating tomorrow once the Pledge is over Brecken said Stinger Waffles (a once-a-week treat I put in her lunchbox). Jordan's response was M&Ms and Skittles.....ok, then! Mike and I are looking forward to a little bit of balance and flexibility, especially when we are away from home. That and being able to dip our fish nuggets in some organic ketchup! Unfortunately (or fortunately), neither of us noticed a big change in the way we felt or how our clothes fit. We think it's because we already were eating clean 80+% of the time. 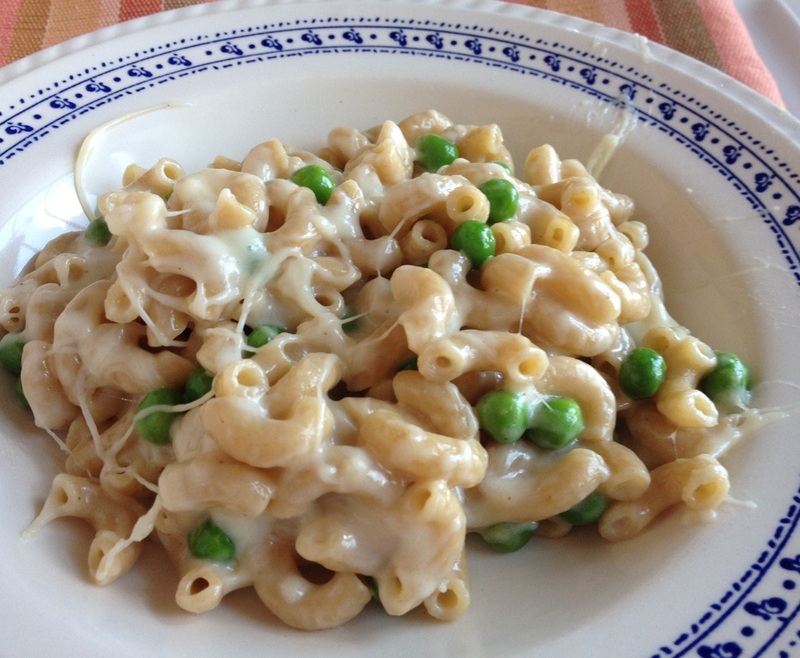 I used to have a voracious sweet tooth (hence, the earlier days of this blog!) but it seems to have subsided quite a bit since the beginning of 2014. That being said, I wouldn't be surprised if I found myself indulging in a cupcake or macaron tomorrow from the local bakery! The Pledge was fun and I'm so glad we did it as a family! 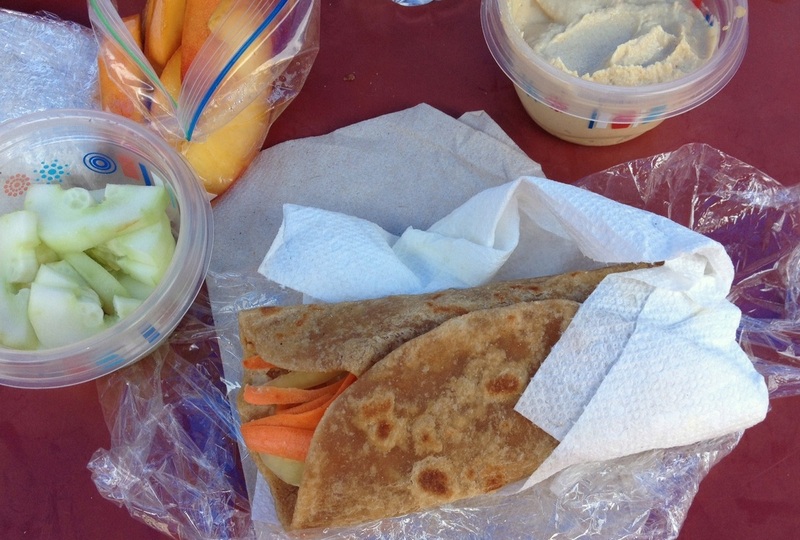 Honestly, the hardest part for me was photographing everything I ate and blogging (almost!) every day. It was a great experience for me because I learned a few tips on food photography with an iPhone and I'm hoping to learn even more with my DSLR going forward. 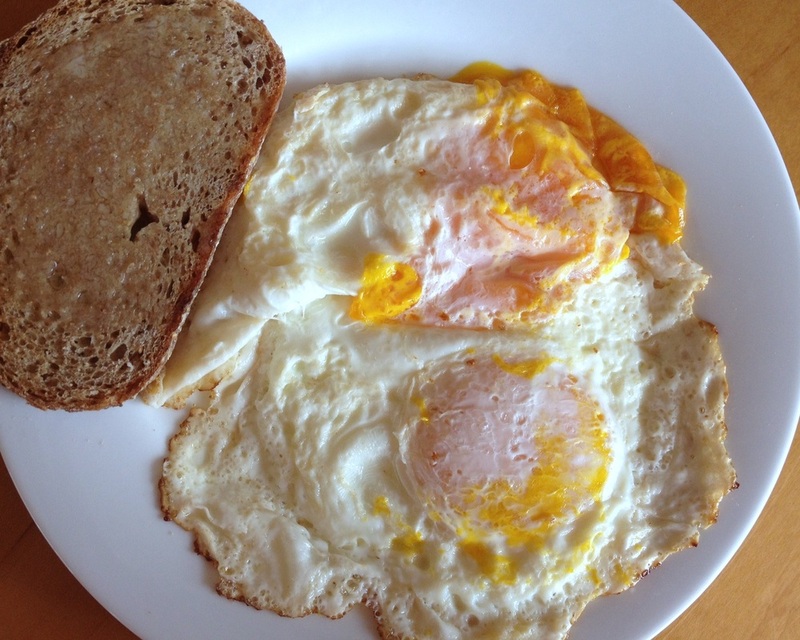 So, without further ado, here's what I ate on my final day of the Pledge! 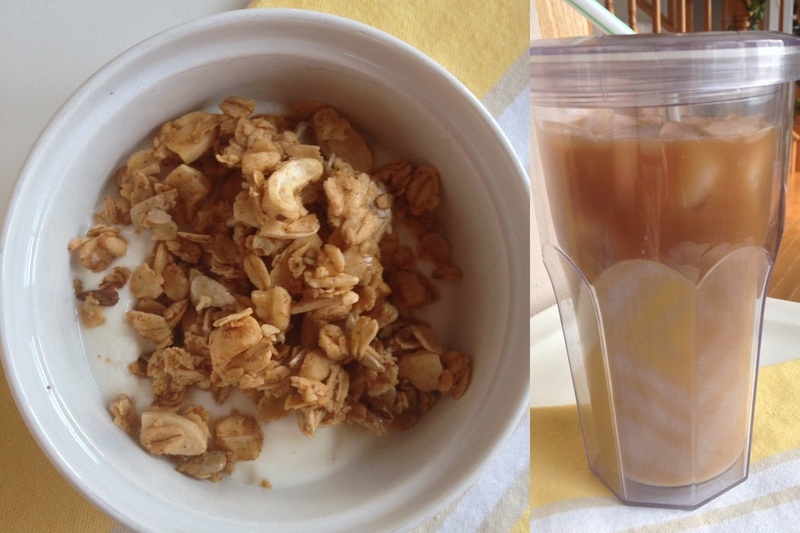 Breakfast was, of course, Iced Coffee with a little Yogurt Granola Parfait. 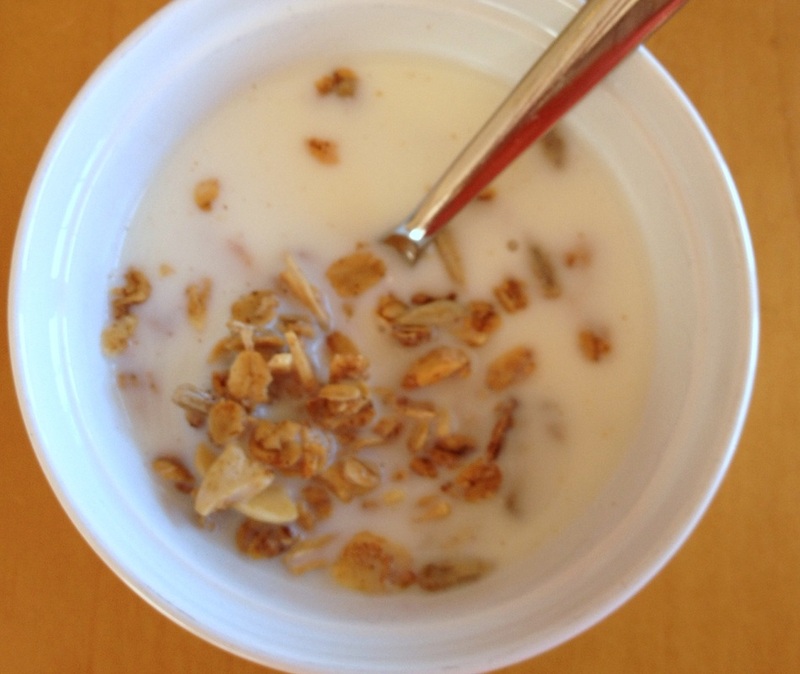 I layered plain whole milk yogurt with some frozen blueberries and my favorite granola. I let it sit about 5 minutes so the blueberries defrosted enough to eat. This was a great treat! I'll be making this again tomorrow! You can tell that Saturday is our grocery day because we are super light on produce. 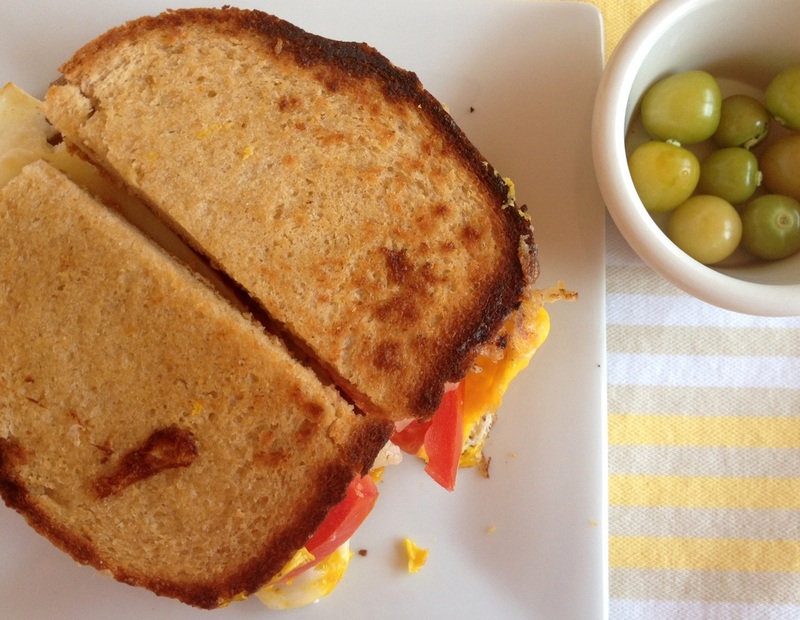 Lunch today was an egg sandwich my hubby make me with my homemade Whole Wheat Bread, a farmer's market egg and a piece of organic cheese. He is such a great cook! 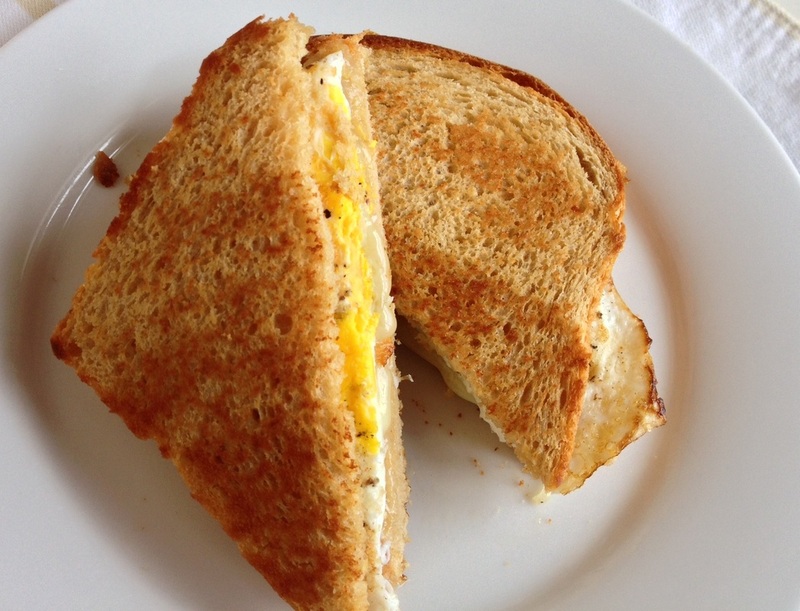 This sandwich was light years better than the one I made the other day! 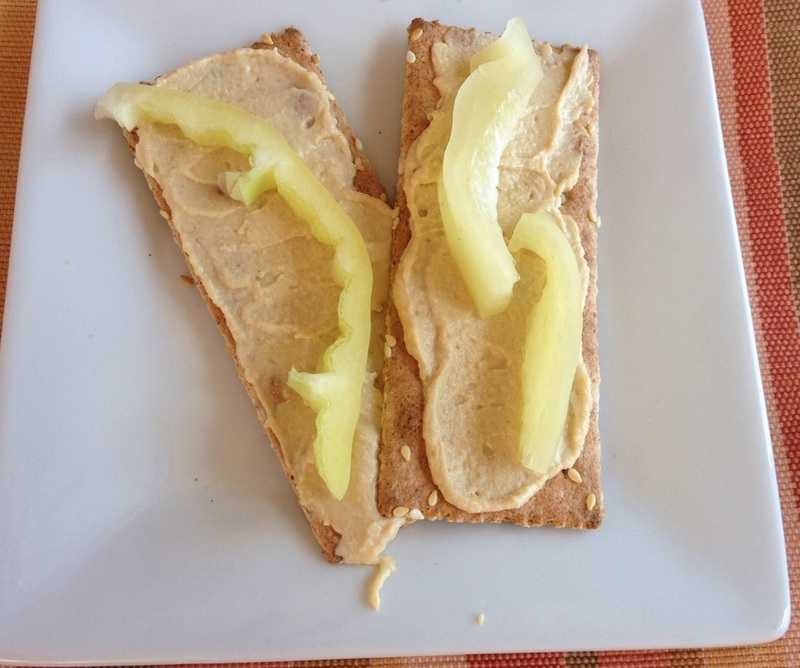 My afternoon snack was some more Ak Mak Crackers with homemade butter and local honey. What a treat! 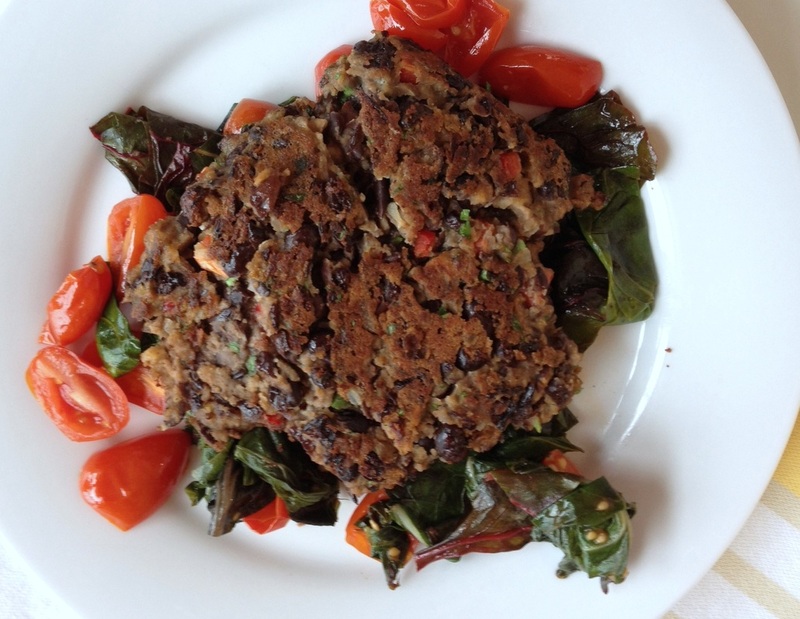 Dinner was a Black Bean Pattu served over sauteed Swiss Chard and Tomatoes. I used to make these patties as burgers and serve them on hamburger buns. They were mushy and fell apart. This is a way better way to enjoy them! Thank you so much for following along during our 10 Day Pledge to eat real food! We had fun! If you took the Pledge yourself, let me know how you did! Do you feel any different? Will you continue to eat this way? I'd love your feedback! 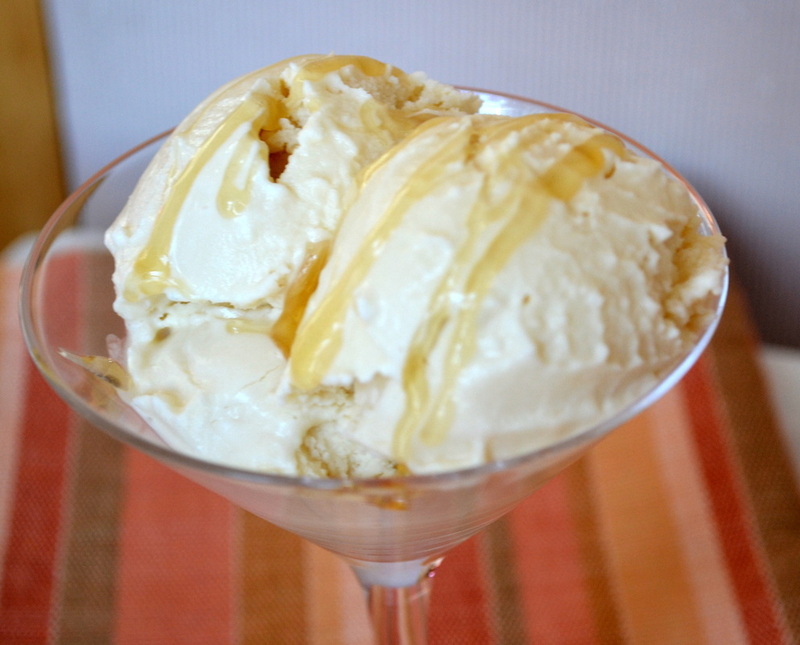 Look for some new recipes on the blog coming soon like Honey Ice Cream, Whole Wheat Bread, Homemade Butter and Granola! It's Day #9 and we are in the home stretch! I can see the light at the end of the proverbial tunnel! A little over 24 hours until our 10 Day Pledge to eat Real, Unprocessed Food is over! All 4 of us are still going strong and loving the real, wholesome, healthy food we've been eating. But we are ready to add a little flexibility back into our lives. I'm so, so, SO proud of my daughters! They are questioning every single thing they put in their mouth and that speaks volumes to me! They are learning! I'm slightly nervous about how they will act on Friday when the Rules are lifted. I've already promised my 9-year-old a trip to Barnes & Noble Cafe to redeem her free birthday cupcake. They are quite big, very rich and filled with bad things. Luckily, the girls have a tradition of always splitting their birthday cupcakes with each other so hopefully we won't fall too far off the wagon. 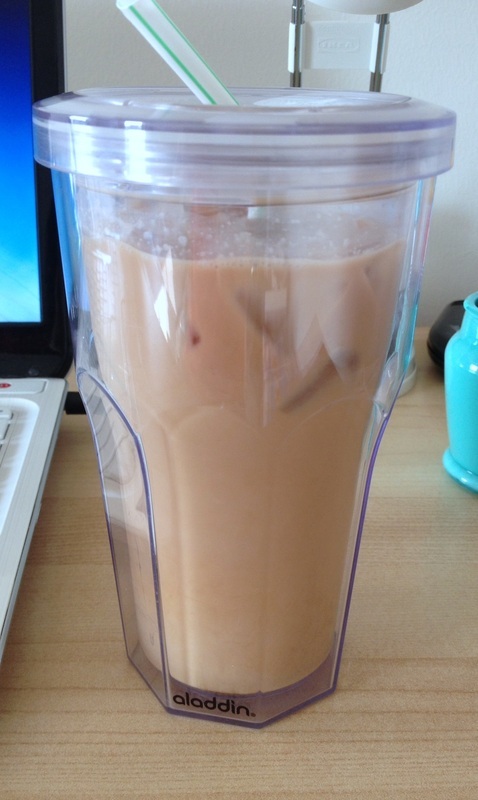 Today started with Iced Coffee, as usual. Because it was so dark and gloomy outside I couldn't get a good picture so I used yesterday's picture for you. 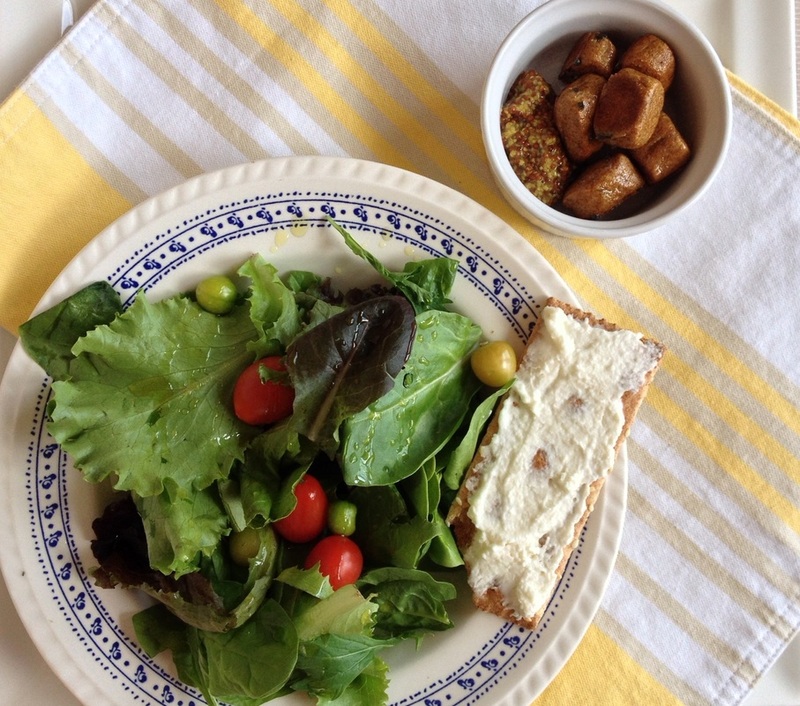 Lunch was some salad greens with tomatoes and ground cherries and some fresh Whole Wheat Pretzel Bites. I also had a cracker with that fresh butter we made. Let's be honest...I had way more than 1 cracker! Like I said, there's another cracker with fresh butter as my afternoon snack! 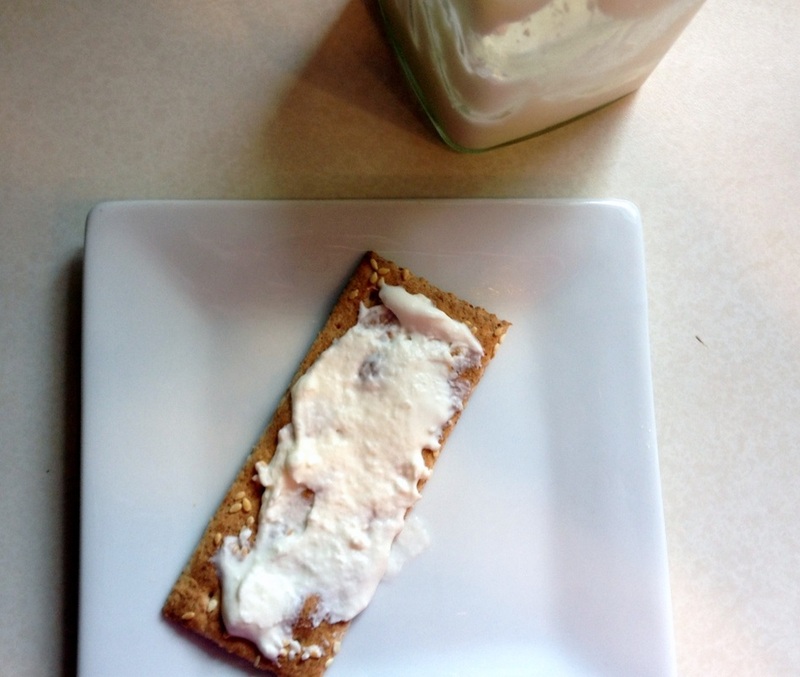 I washed down the buttered cracker with some Coconut Water from Whole Foods. I like this brand because it has no added sugar or natural flavors. 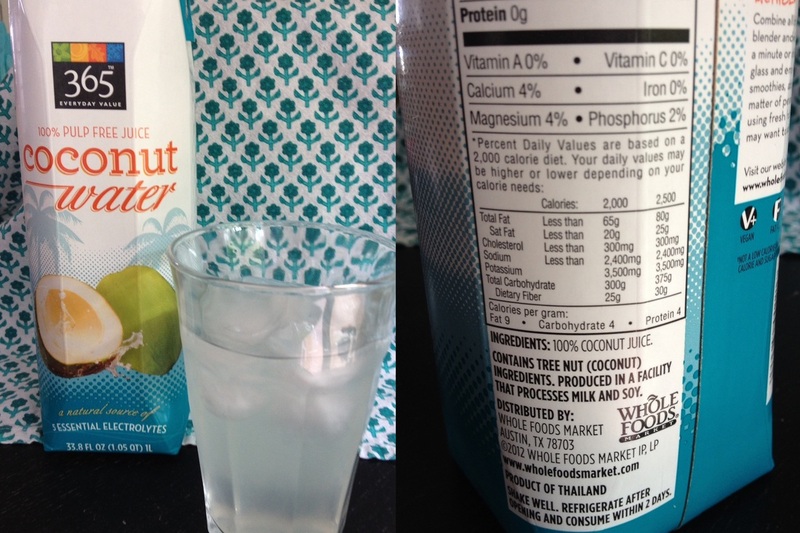 If you like coconut water, take a look at this investigation by Food Babe. Not all coconut water is created equal! I really like the refreshing taste of coconut water every once in a while, but it's not something I drink all the time. 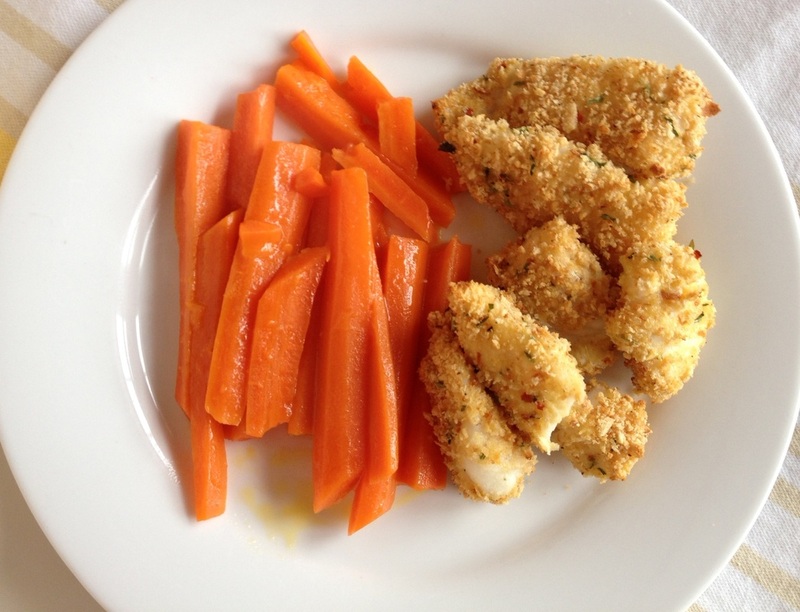 Dinner tonight was breaded fish nuggets made by my husband with the Walleye he caught in Lake Erie a few weeks ago. I made a side dish of glazed carrots using orange juice, butter and honey. The girls loooooved their veggies tonight! 'Dessert' tonight was another small helping of yogurt and granola. It's the salty/sweet/tangy-ness that keeps me going back for more! Tomorrow is our last day and our plans involve my younger daughter spending a few hours with my parents. I'm planning on packing some snacks for her as well as a few pieces of bread so my mom can make her a grilled cheese sandwich for lunch. This is one of those times that the option of flexibility would be a nice treat to have! 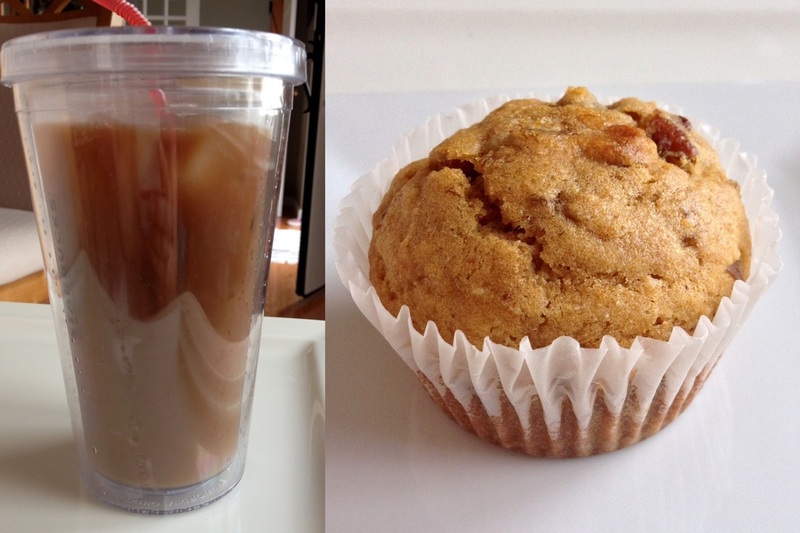 Breakfast was Iced Coffee in a dark and dreary living room - thank you unseasonably cool Pennsylvania summer! 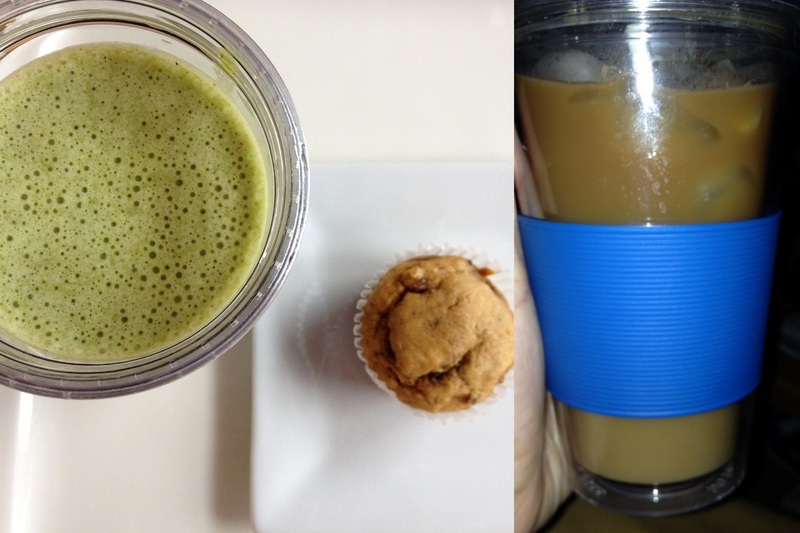 A few hours later I made a Green Smoothie and paired it with a Whole Wheat Banana Pecan Muffin from the freezer. This is where it all fell apart for me. We were out shopping when hunger hit and hit hard. Luckily, I had almonds in my purse so I had a handful of them to hold me over. I knew our next stop was at Whole Foods for some food shopping so I figured I'd grab some lunch there. When we got there I was thrilled to see that all of their Prepared Foods have the ingredients listed on the label so I was able to find something that followed The Rules. I am still leery of most meat that I don't buy from the farmer's market and prepare myself so I stuck to vegetarian dishes. I did manage to find some options for my girls, but honestly, I feel their Prepared Foods are so overpriced that I wasn't willing to pay for sub-par food for me when I knew I could eat at home in an hour. The girls got Mustard Mashed Potatoes, Cooked Peas and Carrots and some fresh veggies from the salad bar. They totally loved their food! I had a few bites of their dishes and they tasted fine but I found them to be bland and, well, overpriced. My husband decided to hold himself over with a GT Synergy Citrus Kombucha, which we shared. Though it's pricey, I love this stuff and it follows The Rules! 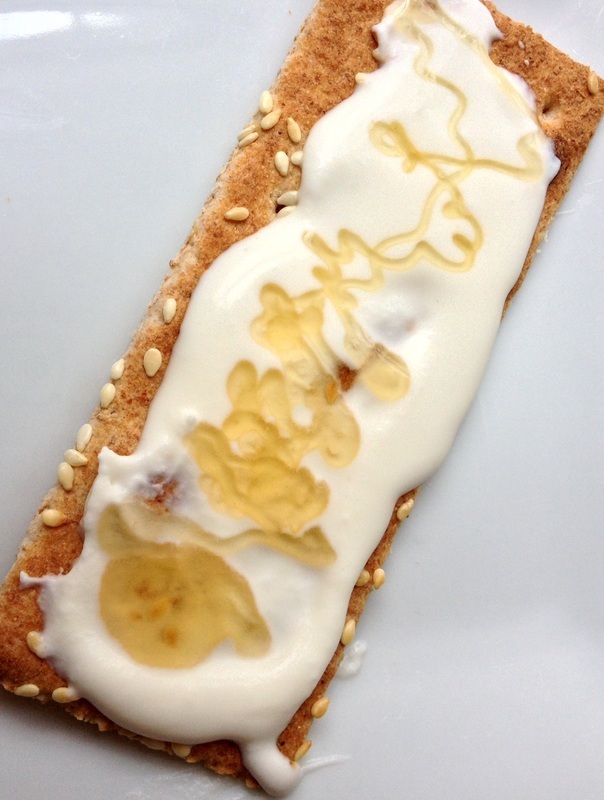 Once we were on our way home I broke open my emergency stash - A Banana Bread Lara Bar. Man! I did so good yesterday all because I planned! All day today I kept thinking of this phrase I heard often back during my Weight Watcher days: Failure to plan, is planning to fail. 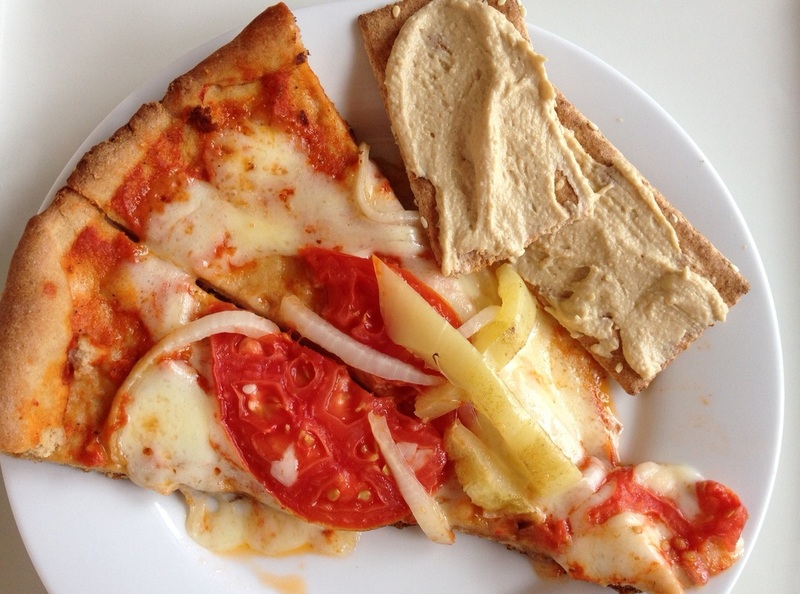 When we finally got home I heated up some pizza from last night and had some hummus on Ak Mak crackers. Ahh....no longer hungry! 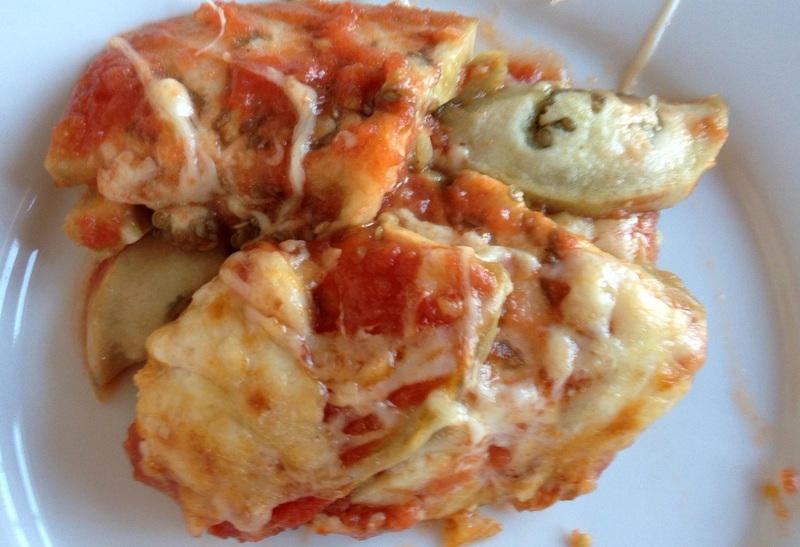 Dinner tonight was a quick Eggplant Parm. It was so tasty and satisfying, but not very pretty to photograph! 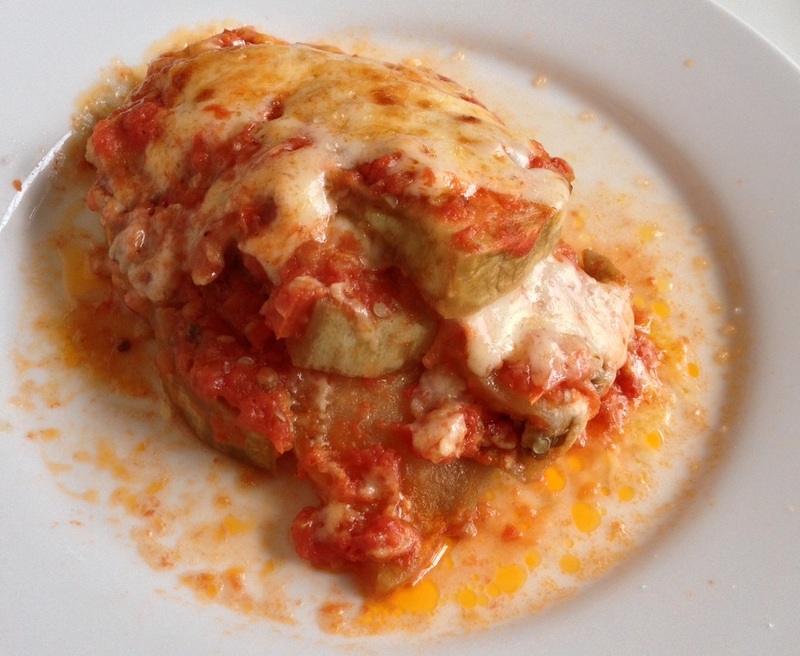 I've made this dish a few times now and I think it's time to put a formal recipe together for you so you can have quick Eggplant Parm on a weeknight! I'm so happy today is over. That trip to Whole Foods almost broke me. They have lots of good things to eat but so few items that follow The Rules. I'll be happy when the 10 Day Pledge is over and I can go back to my 80/20-ish way of Clean Eating! Day 4 is almost over and I think this may have been our easiest day so far! Luckily, our travels today to the pediatrician did not include any unsolicited snacks for my girls! Hooray for small victories! Today's food was a little boring until dinnertime - mmmmm.....cheeseburgers and red wine! Since the buns were homemade, whole wheat and the burger was local, grass-fed meat everything still followed 'the rules'! I'm a little nervous about tomorrow. We are heading to the zoo for the day and though I plan to take snacks and veggie wraps I'm worried about the abundance of tempting goodies my girls will want! I'm going to hold my ground and stay strong...it's only for 10 days! 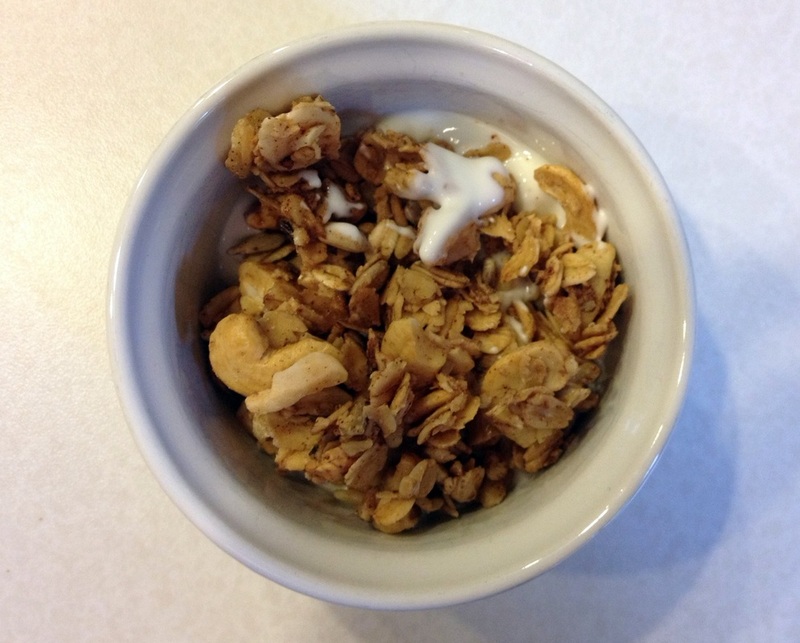 Before I share my meals for today, I want to share my 6-year-old's breakfast. She was so proud that her breakfast choice was allowed on the Pledge that she wanted me to take a picture of it! Melt my heart! 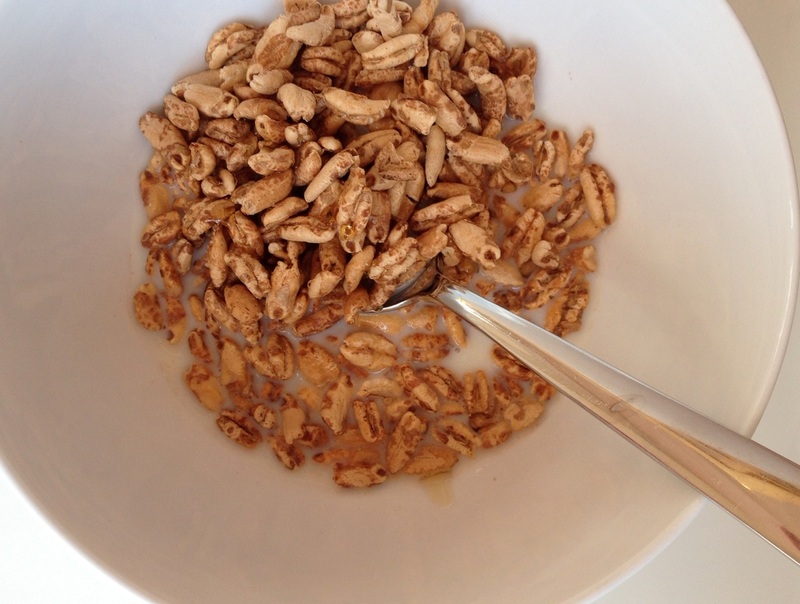 She had a bowl of Puffed Barley cereal with whole milk and honey. 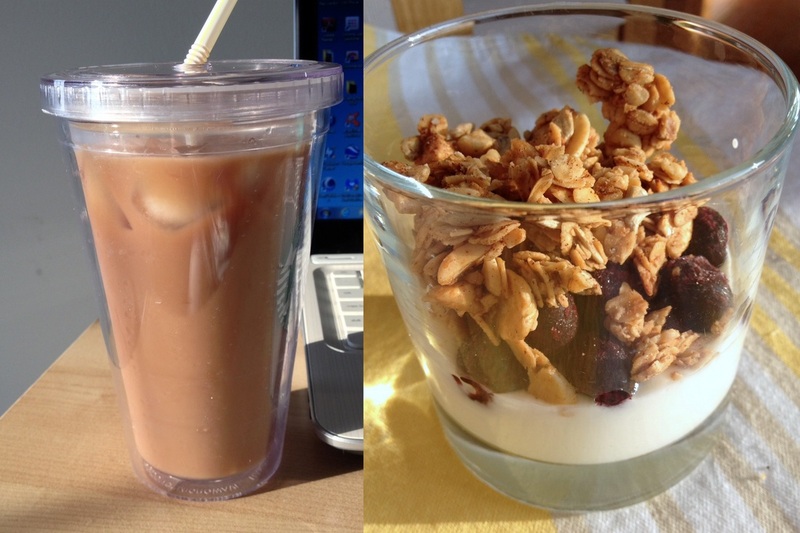 My breakfast was more Iced Coffee and some homemade granola served 'cereal-style' with whole milk. Lunch was more leftovers from earlier this week. 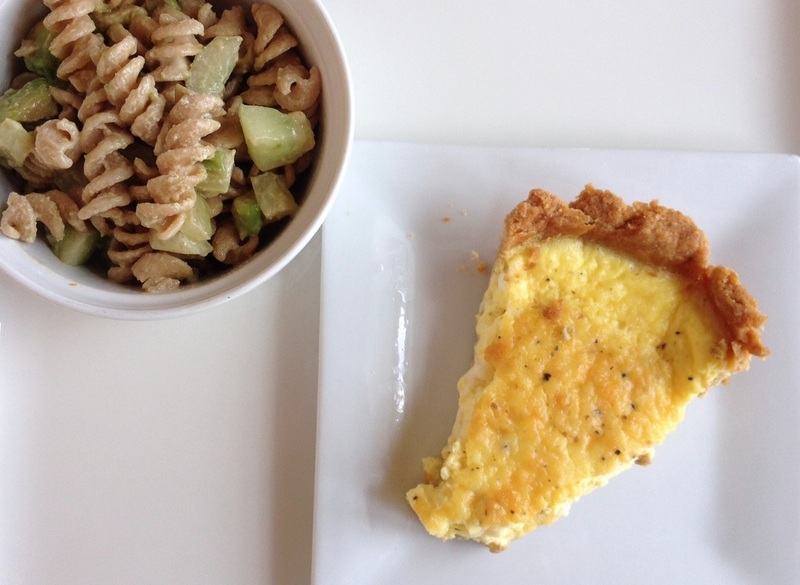 Pasta Salad with Tahini Dressing and Quiche. 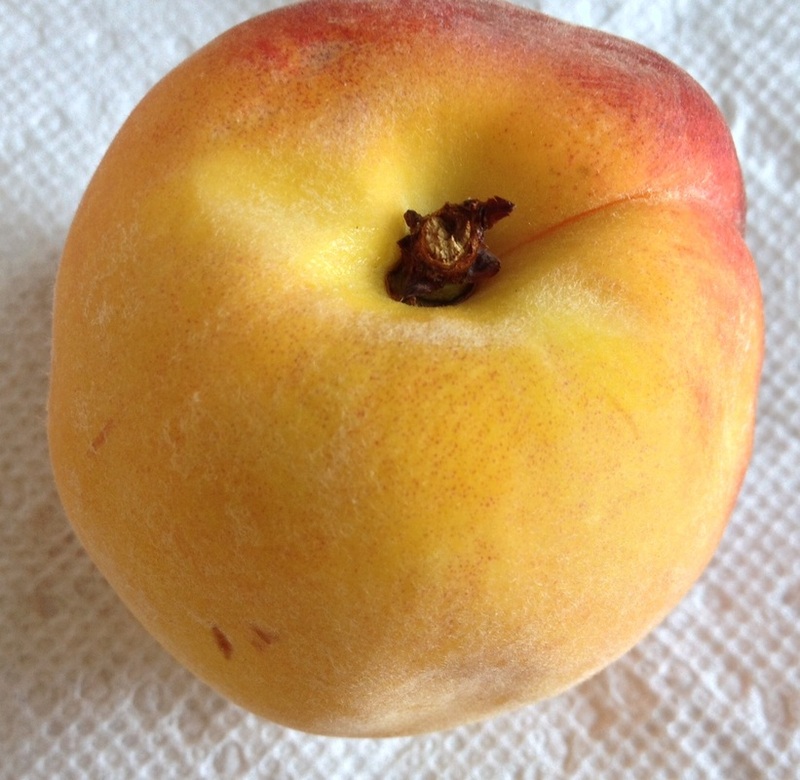 My after-lunch snack was a fresh peach from the farmer's market. I patiently waited for dinner with my stomach grumbling but it was soooo worth it! 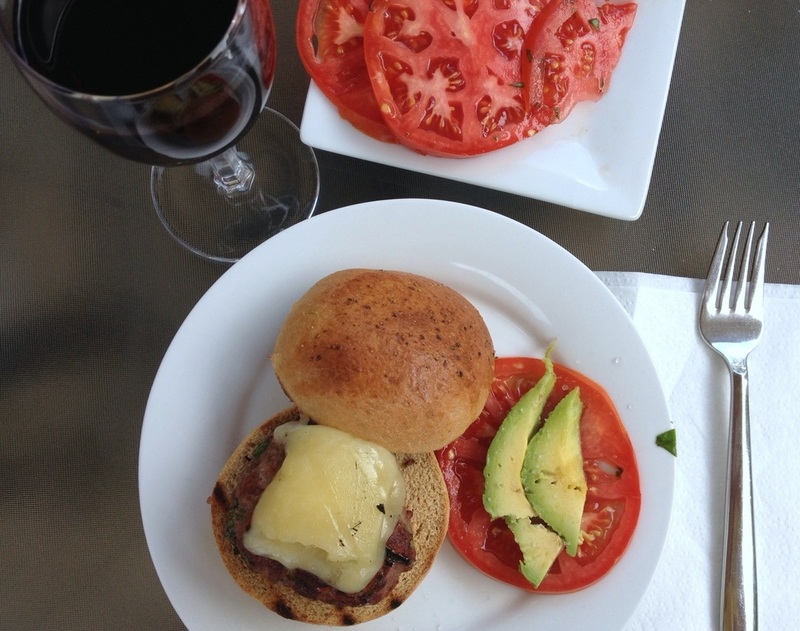 Cheeseburgers made with local, grass-fed beef, organic cheese and homemade whole wheat buns. 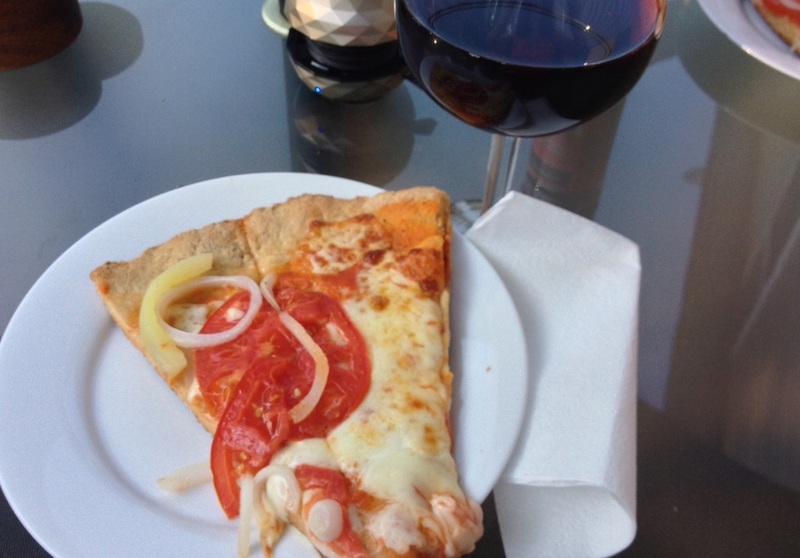 We served it with farmer's market tomatoes and an Italian Chianti. Yummm! Cheers to Clean Eating! Today was Pledge Day #3 and it came with more challenges. Mostly for my girls, not so much for me. Today was a calm day where we found ourselves at home for all of our meals, but a quick trip to Costco almost derailed all of my 9-year-old's efforts so far! We went in there for one thing...ONE THING! We found ourselves wandering around for over a half hour looking at all the new things they have in stock. Without fail, we found ourselves walking past sample after sample. None of the highly-processed, over-sugared 'food' tempted me at all and my 6-year-old really held strong, but the sights of the treats nearly broke my 9-year-old. She wanted everything! I don't think she even knew what they were giving out, it was just the sheer fact of having the forbidden food that lured her. I thought we'd be ok walking down the dry goods aisles (honey, nuts, etc), but all she saw were the giant boxes of Goldfish Crackers and Oreos that were sitting just one aisle over! I realized I had to get her out of there so I quickly took her over to the books and movies so she could browse and...suddenly....all the junk food she just wanted a minute....was a thing of the past! Way to go J!! I know it's hard for them and I can't say enough how PROUD I am of them for sticking with me on this! 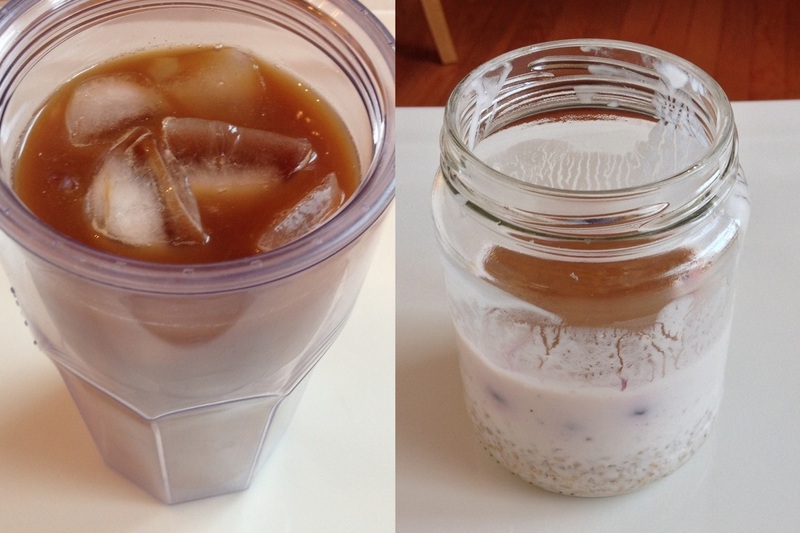 Once again I had Iced Coffee with Overnight Oatmeal and a dollop of Almond Butter. 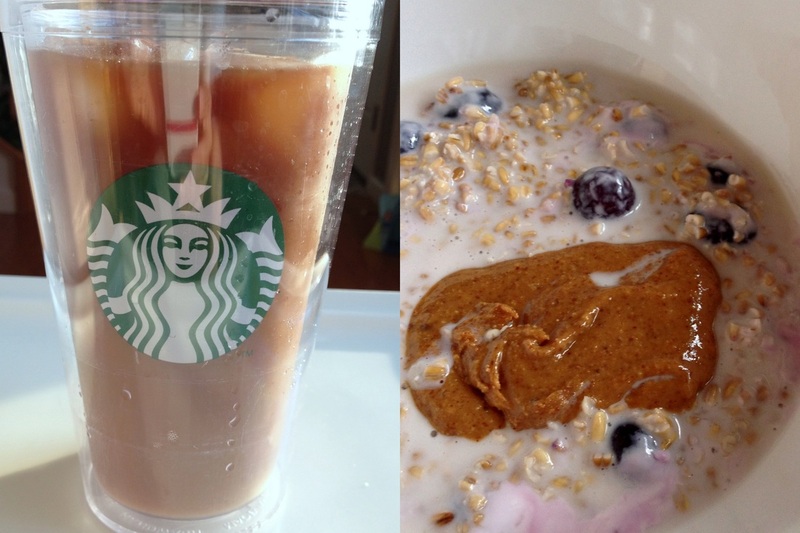 I tried to make the oatmeal a little prettier for you, but I'm not sure I succeeded! Tomorrow I think I'm going to eat something different! 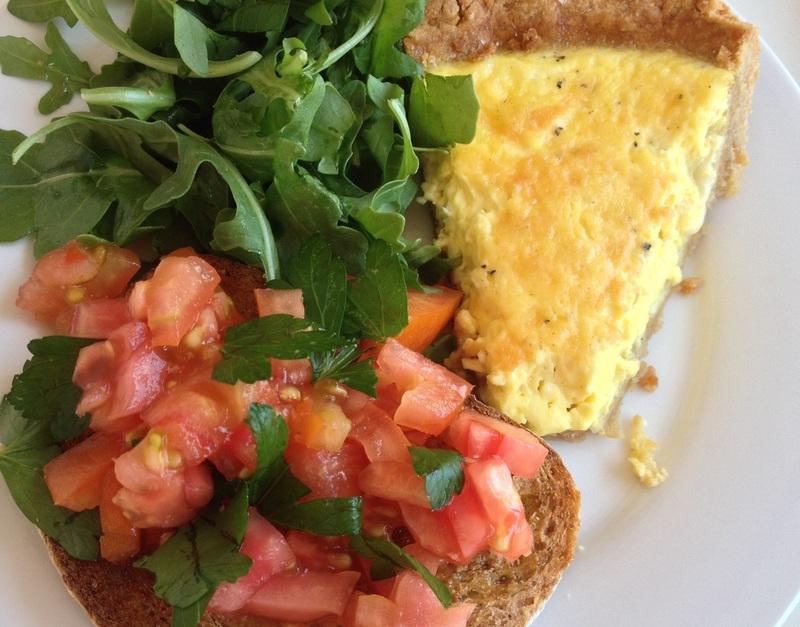 Lunch was leftover Quiche from dinner last night, a little bit of arugula and a quick bruschetta-type toast. I diced up some tomatoes and parsley and put it on top of a piece of Whole Wheat bread from a local bakery. They told me they only use 3 ingredients in this bread! They don't even use yeast! My husband and I indulged in a seriously TINY scoop of last night's ice cream after lunch. I really wanted to have a scoop to see how the texture held up and I'm thrilled to say it was simply perfect! 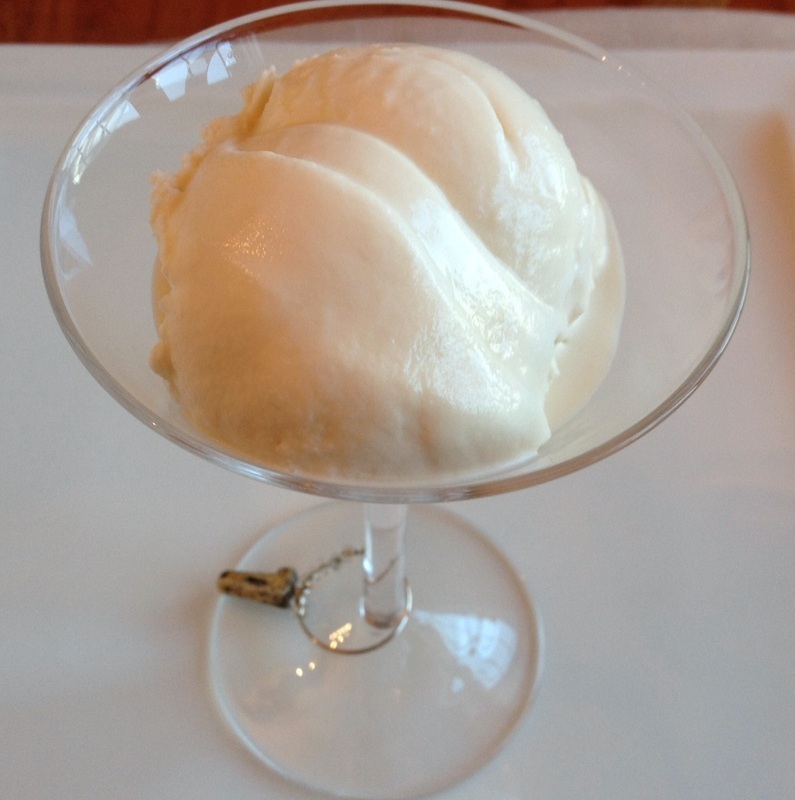 This ice cream recipe may become an unhealthy obsession of mine! 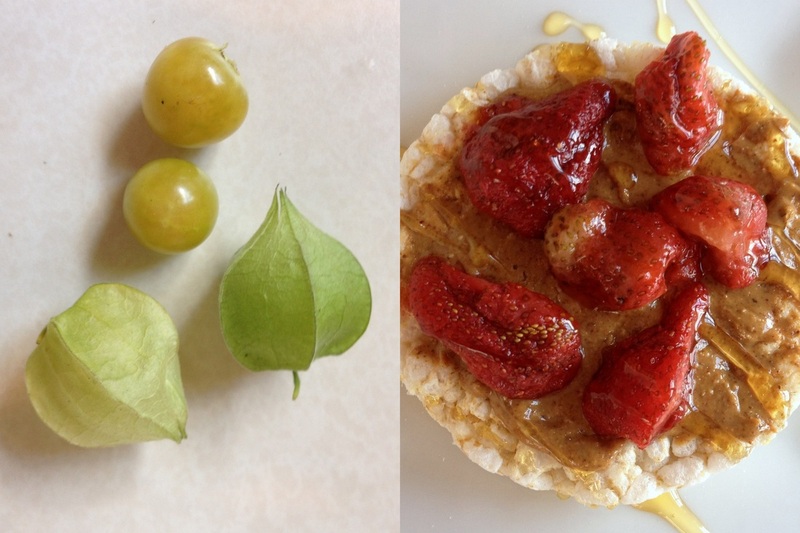 My mid-afternoon snack was a handful of Ground Cherries from our garden and a Plain Rice Cake topped with more Almond Butter a few defrosted strawberries and a drizzle of honey. Dinner tonight was perfection! Not only was the entire meal local from Pennsylvania, but it was entirely cooked by my hubby! Whew! I needed a night off! He breaded a piece of Walleye (from his fishing trip to Lake Erie last week) with some homemade, whole wheat breadcrumbs from the freezer. 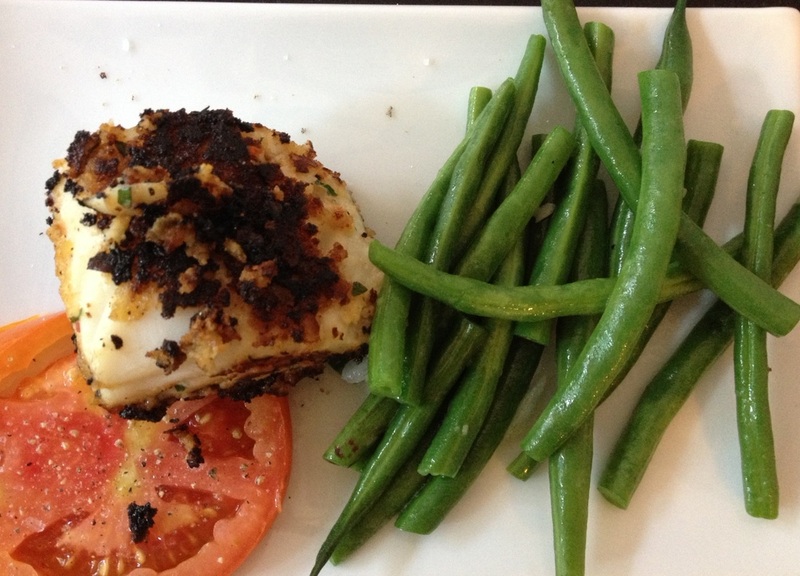 He served the fish was some sauteed Green Beans and a slice of tomato from our farmer's market last night. 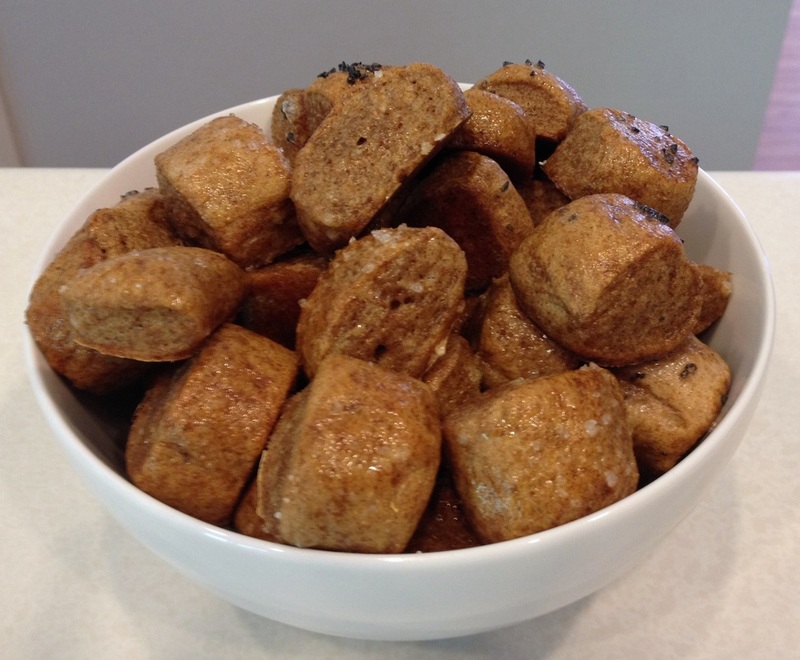 My evening snack was a few Whole Wheat Pretzel Bites (recipe coming at you tomorrow!) with some stone ground mustard. See the mustard? Right there in the left-hand corner of the bowl? That little tablespoon got me in trouble. Like a rookie, I squeezed some mustard into the bowl and enjoyed my little snack. Only AFTER I finished the pretzels did it dawn on me that I forgot to read the label on the mustard! Yikes!! I immediately ran to the refrigerator to look at the label only to find....sugar!! Why?? Why does sugar have to be in everything???? *sigh* I try so hard all day, every day to avoid sugar and it sneaks into my MUSTARD???? Live and learn. The next time I go to Whole Foods I'll be sure to look for a tasty mustard that doesn't have sugar in it! Day 2 of the 10 Day Pledge is almost over and I have to say...so far, so good! Today the girls and I were out for a few hours right smack at lunchtime! 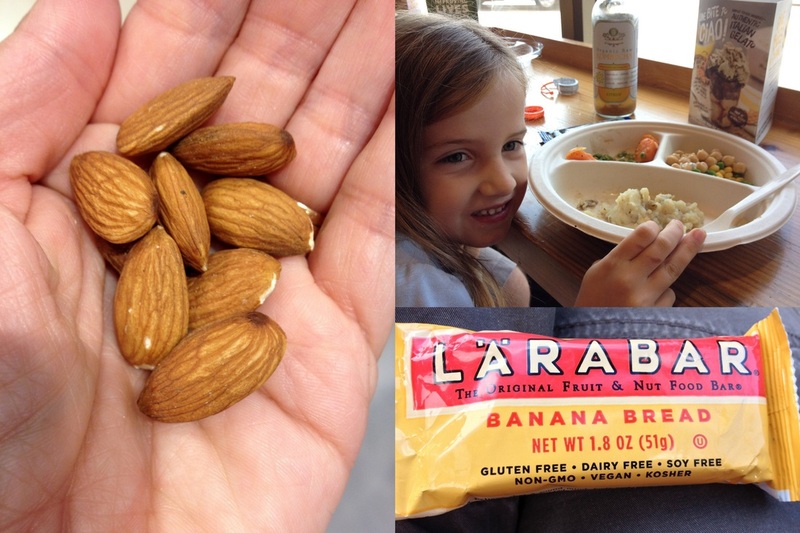 We made it through our hunger with some snacks - a Lara Bar for me and homemade granola for them. We ate a late lunch, which led to a really late dinner. Their shining moment today was when they politely declined a free fudge sample at the farmer's market! I'm so, SO proud of them! 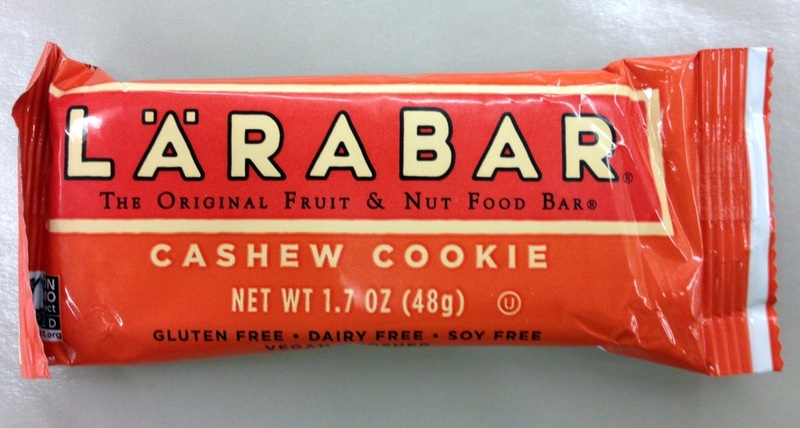 My snack while we were out was a Cashew Cookie Lara Bar. What I love about these bars is they only have a handful of ingredients and most of them have no added sugar. 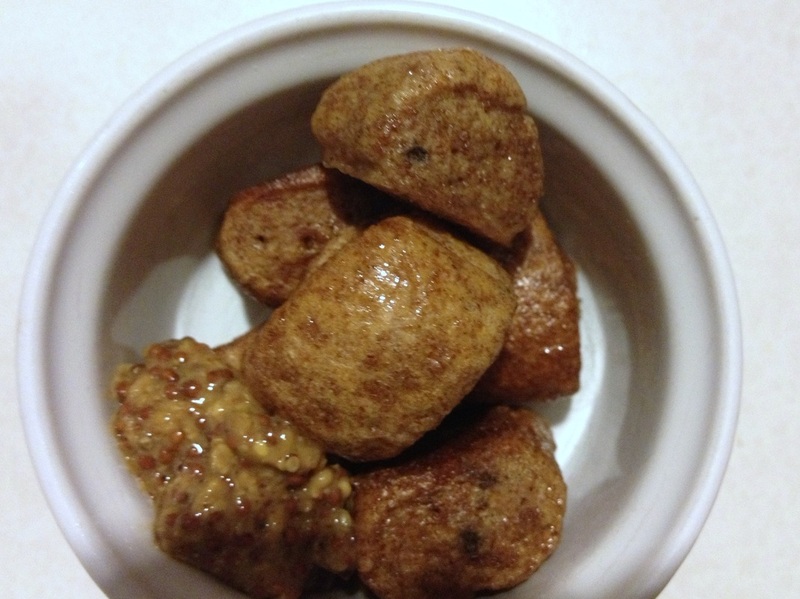 This one has only 2 ingredients - dates and cashews. These are perfect to slide into your bag for when an unexpected stomach grumble hit! 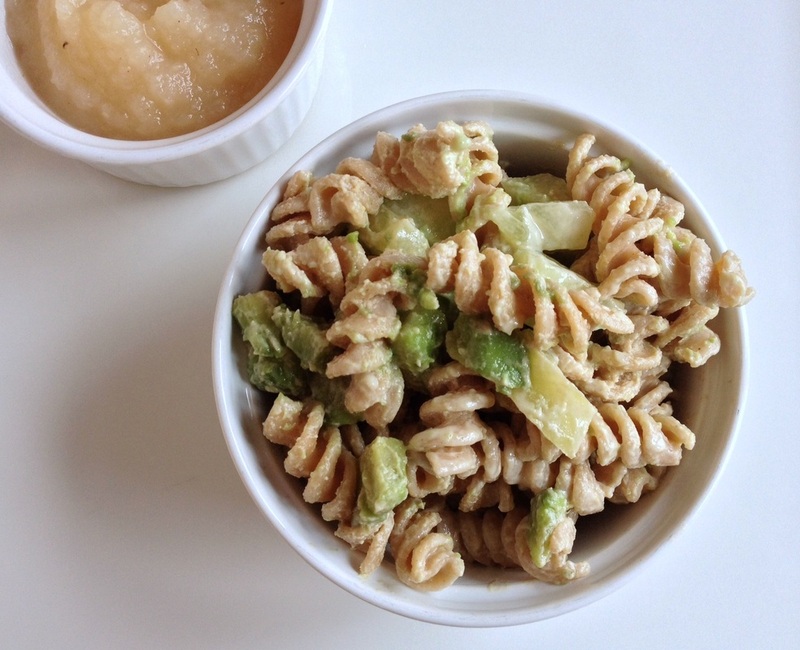 When we finally got home for lunch I had whole wheat pasta salad with tahini dressing and a cup of organic applesauce. 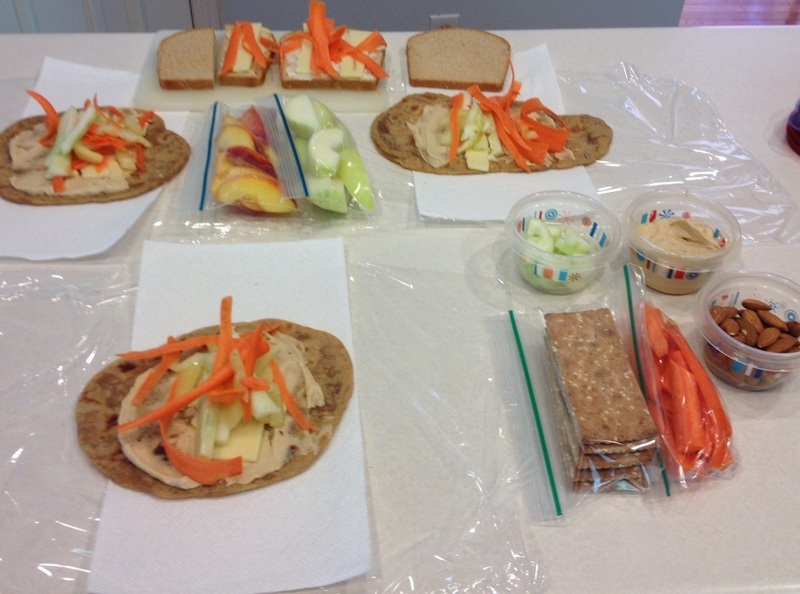 It's funny how reintroducing a simple food to kids really gets them going. We haven't had applesauce in quite a while and they went nuts over it! They both had seconds! 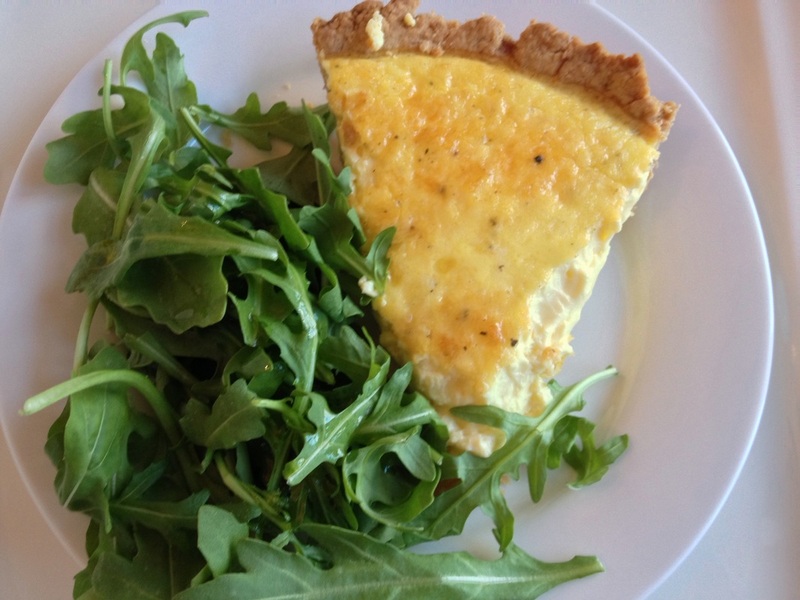 Our very late dinner consisted of a simple cheese quiche with a side of arugula. I love this dish! My older daughter still fights me on this one. When did she stop loving eggs??? Ok, this is it! This is the star of our show! Remember that ice cream I was 'taste testing' last night? Well earlier today I threw the cooled mixture into my ice cream maker and whipped it up for tonight. Wow! This stuff is amazing! Seriously amazing! 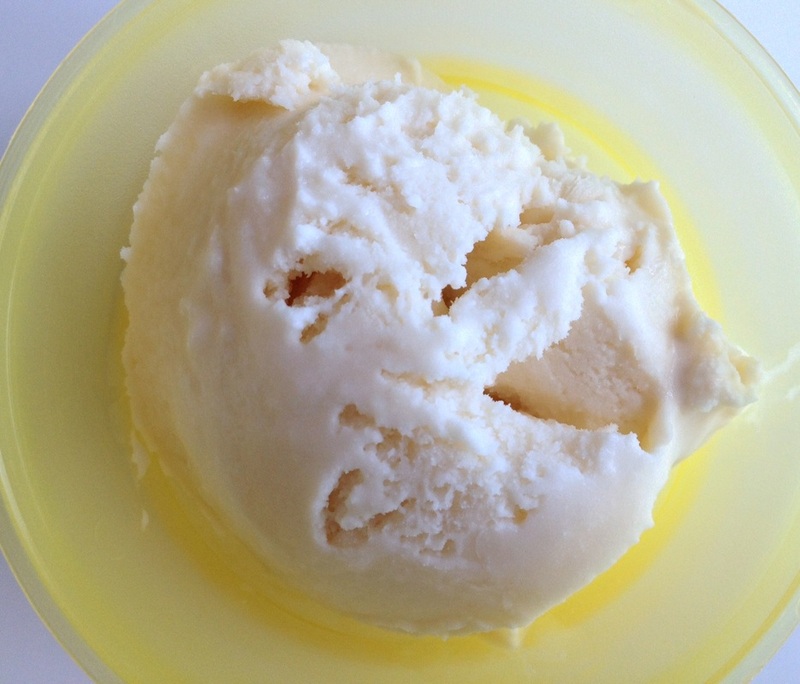 I've been making ice cream for a few years but I've never really been able to nail the texture - it always comes out rock hard and/or grainy. I think this recipe may be the one I've been looking for my whole life! 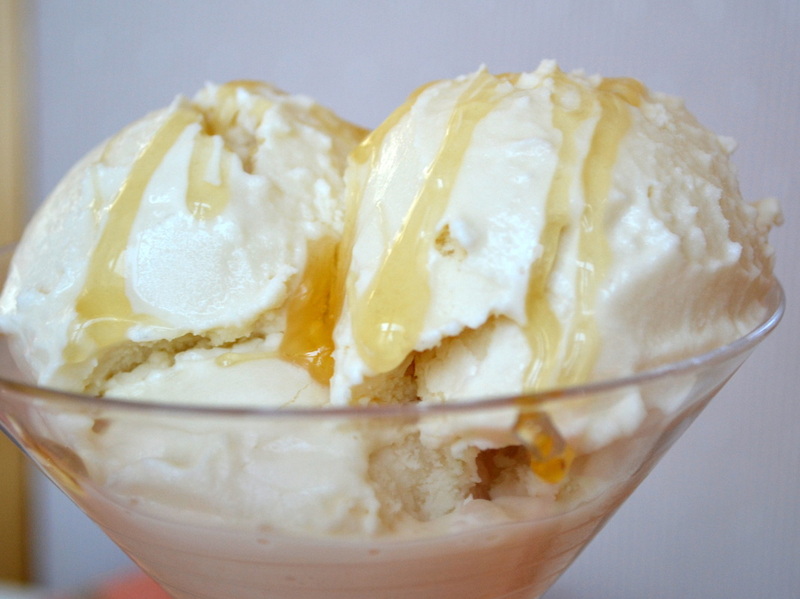 It's a simple vanilla, but rather than using sugar to sweeten it, it's sweetened with honey. I used local honey and....wow! Best part of Clean Eating. Ever! 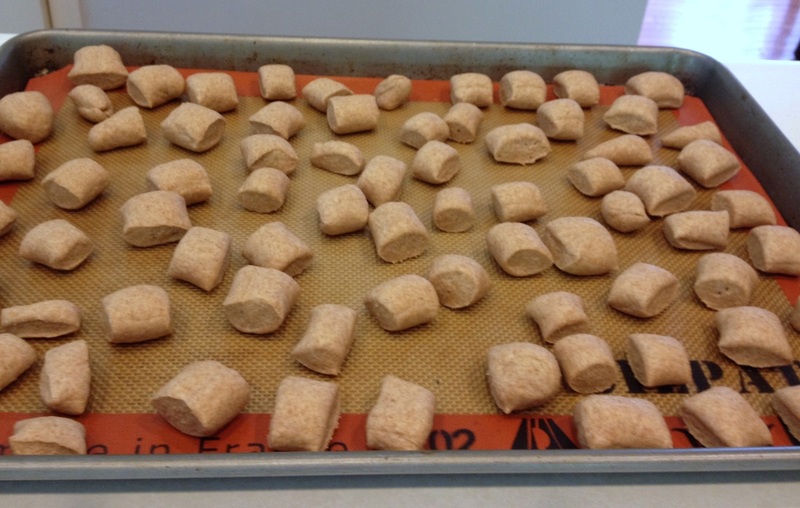 Now that I've talked it up, you guys probably want the recipe? Let me tweak a few things but I'll be sure to get it up on the blog before the end of summer! Time to rest and relax and get ready for Day #3!